This dish was inspired by my recent London treasure hunt, where I was given an insight into the fascinating culture of Hong Kong. Read more about my experiences here. Plate up and enjoy the delightful flavours of Cantonese cuisine! Tasty ingredients, simple making way and after making heart touching smell and unforgettable flavor always makes me amazed and greedy. Thanks mate. I’m hungry for to taste it. 🙂 Thanks for the useful ingredients, Hopefully I will taste it today evening. LOVE. . . LOVE…..for your this touching post. 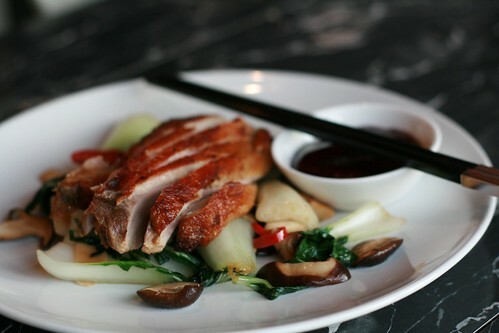 Pan fried duck with damson sauce, bok choi and shiitake mushrooms is my favorite and have not any week I was not tasted it. Thanks for provided ingredients. Did you cook it? I wish I would have picked up some Damsons this year. yes, it’s a favourite home recipe of ours because we have a damson tree! so we freeze them and then have sauce like this all year.